“Billy” Demish plays hockey in Medicine Hat. 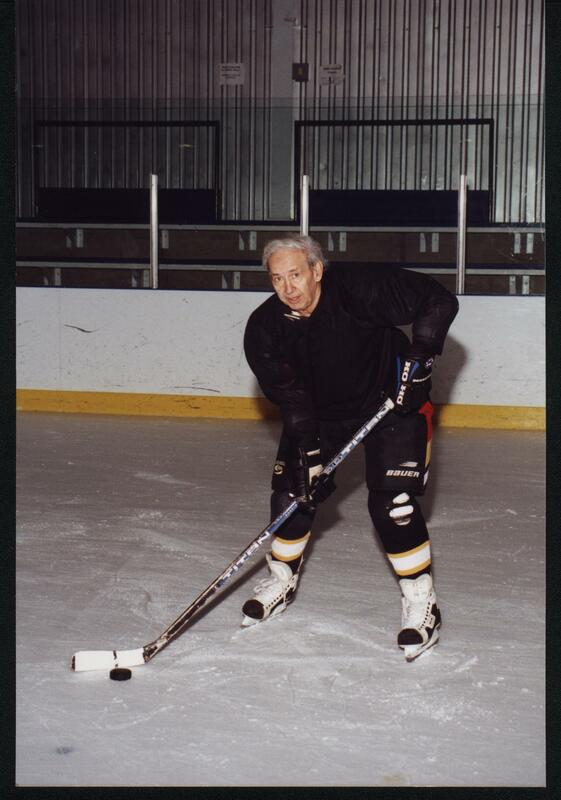 This photo was taken a few years ago when Bill was in his mid-70s, playing for an old timers team. Last night I had the pleasure of talking with Bill Demish. Bill is a hero. Heroes, in my book, are people who have endured hepatitis C, health professionals and advocates who support the hep C community, and in particular, people who went through treatment with interferon. Bill went through treatment twice with the dreaded drug. A hockey injury in 1986 led to his infection. He took a hard fall that caused internal bleeding. That led to a transfusion. Fifteen years later he received a letter suggesting he get tested for hepatitis C. Bill learned he had hep, was treated twice before he was cured, and was left with cirrhosis. He was among thousands of Canadians who were part of the class action suit against the Red Cross, the Government of Canada, and the provinces, which were accused of allowing transfusions of tainted blood. Bill received a small settlement from the law suit. Although the deadline for initial claims is over, if you have just learned of your infection, you can still make a claim.